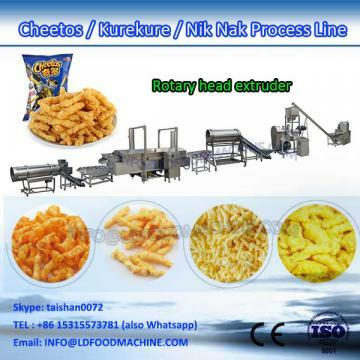 Rotary Head Kurkure Extruder special extruded snacks, very crunchy and great in taste. Rotary Head Kurkure Extruder are made by a special Rotary Head Kurkure Extruder process. The corn grits are moisturized in the flour mixer with water and fed to the rotary head extruder. In the extruder, due to the two rotary plates, the corn grits are squeezed and twisted to curls shapes. The cutting knives can cut into required lengths. 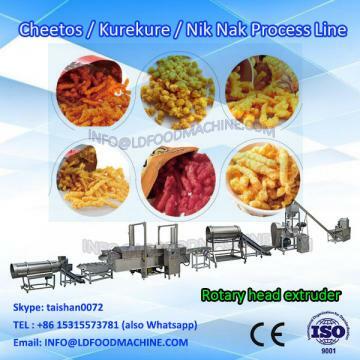 The Rotary Head Kurkure Extruder are fried in cooking oil or toasted in oven and then cooled before flavoring. Seasoning is sprayed on the surface to achieve different favorable tastes. 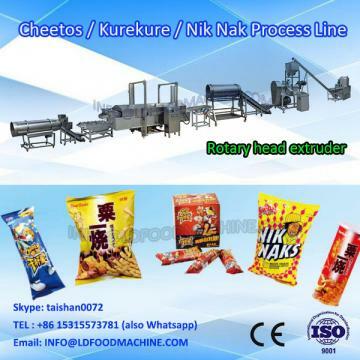 Due to the delicious flavors and nutrition, Rotary Head Kurkure Extruder is quite popular with consumers. The plant layout design, assembling and installation, start-up and local team training will be free at no cost. But the buyer should be responsible for the round-air tickets, local transportation, accommodation, and US$80/day per person for the pocket money to our technicians.